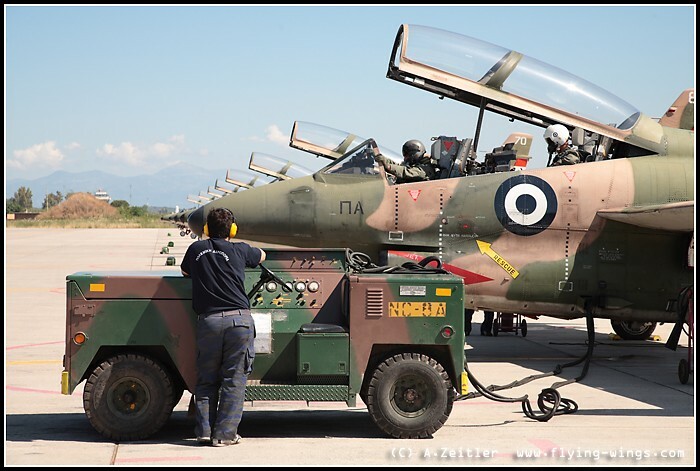 Very secretive and mostly inaccessible the HAF (Hellenic Air Force / ΠΟΛΕΜΙΚΗ ΑΕΡΟΠΟΡΙΑ) possesses a very interesting and mixed fleet, including some of the most appealing aircraft around Europe – either way because of the uniqueness of the type or just because of their striking camouflage. 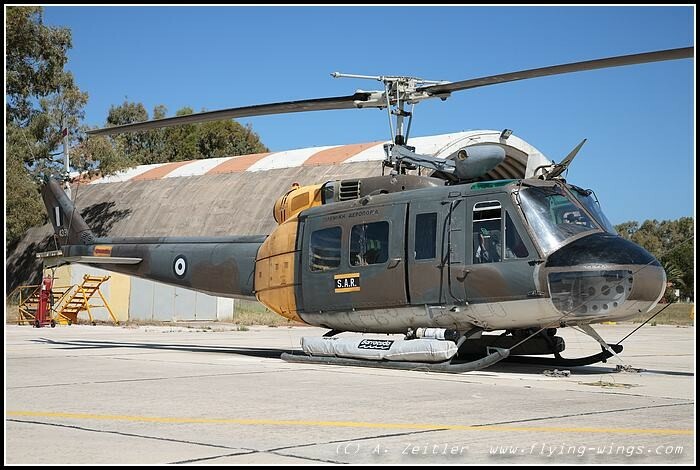 Once the permission was given I have had the possibility to visit the airbases in Araxos and Kalamata on the Peloponnese peninsula, where I met a whole nice bunch of people who tried to organize nearly everything to get the desired photographs. 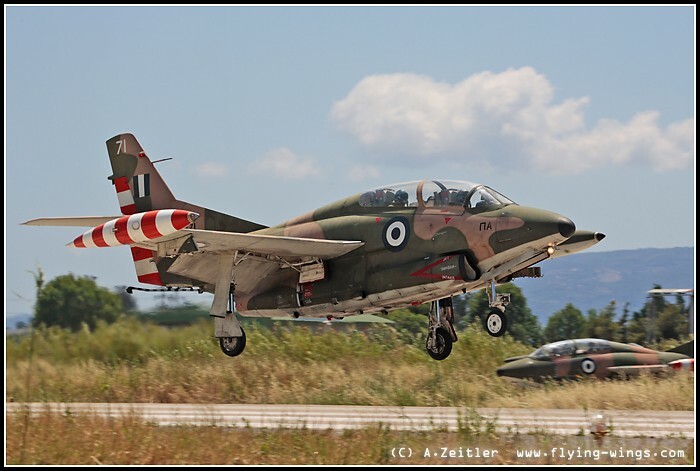 It seems like a big coincidence with the numerous ancient and historic site of the Peloponnese that this peninsula als host two of the oldest flying types of the HAF: the A-7 Corsair and the T-2 Buckeye, based at Araxos in the North of the island and Kalamata in the South. 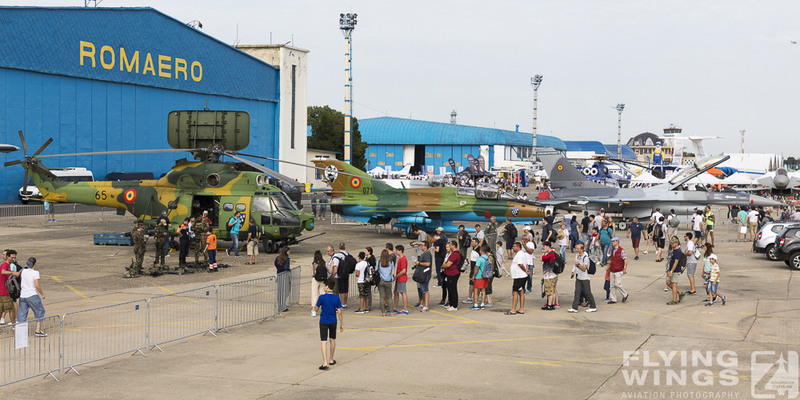 Both of these types are quite unique in the use of Air Forces worldwide and were therefore really worth a visit. 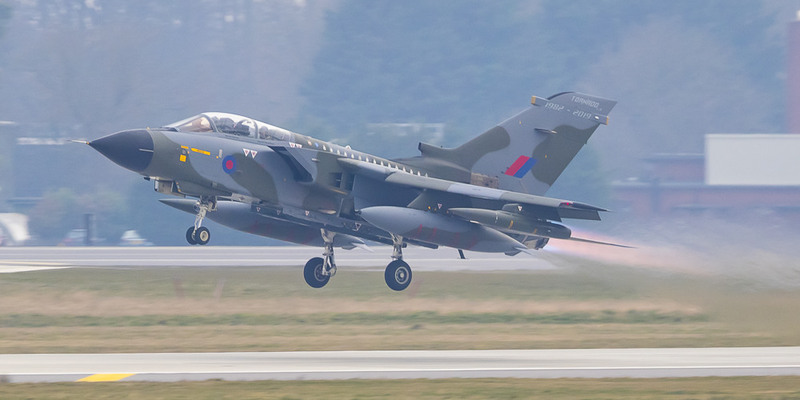 However the former will soon be replaced by the HAF's mostly advanced aircraft and the latter one is the first step of the pilots to fly these jets later on. 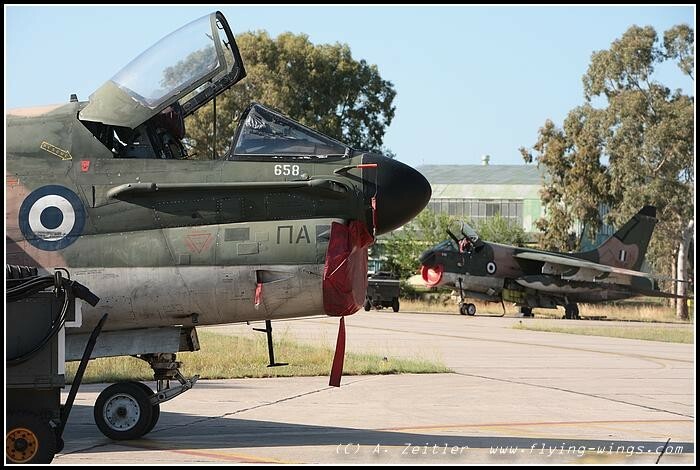 After a lot of pre-dated arrangements the gates to these two airfields opened and I have been granted an insight view of the HAF's daily business. I started my visit a Araxos, where I arrived after my arrival at Athens and a quick tourist stop at the Corinth Canal. 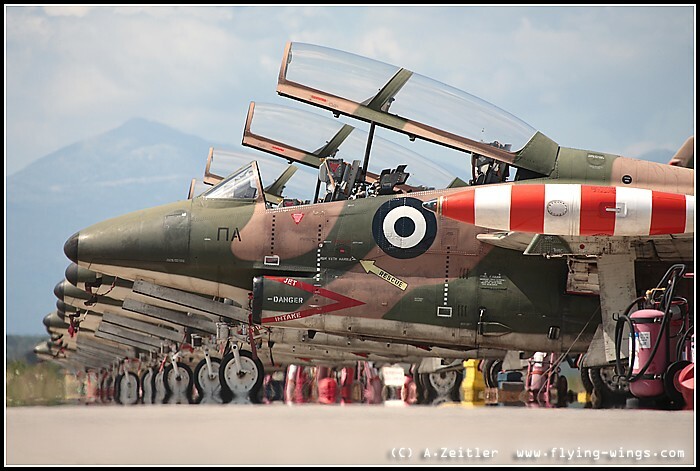 The first stop in the early morning hours was the shelter area, where the sight of numerous A-7E Corsairs sitting around in the front of the shelters on the airfield was an overwhelming sight. Afterwards I went on to the 335 “Tiger” Squadron and got a presentation of its history, its misson and its aircraft: the A-7E Corsair. 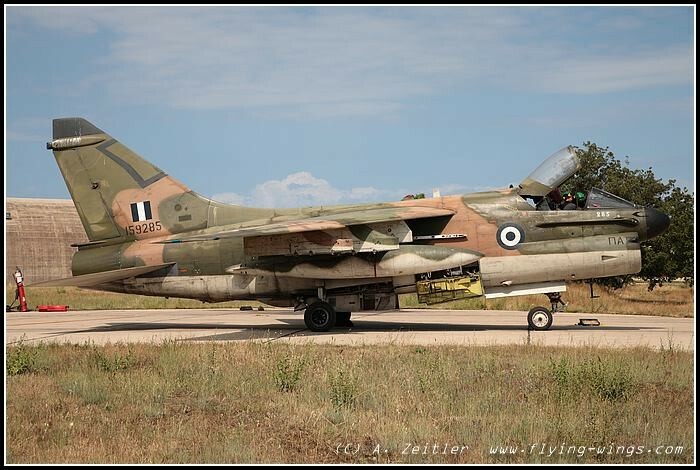 During this informative briefing the pilot also explaind some special facts about their aircraft, for example the main disadvantage of the A-7 that is at the same time also its main advantage: is the lack of an afterburner. 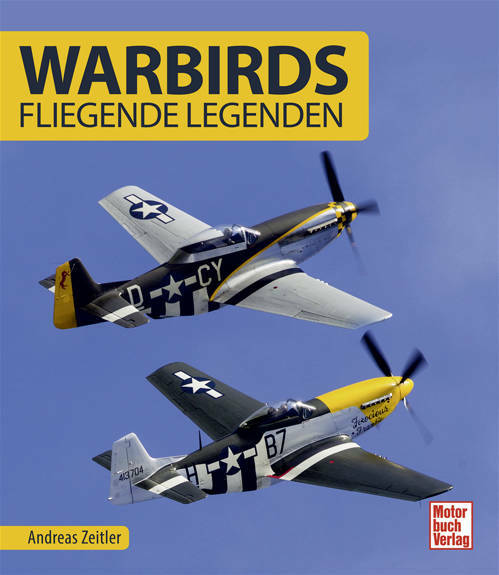 This proofs to be a special benefit in air-air combat, where even very sophisticated and specially to the air-air role designed jets like the F-4E or F-16 have difficulties to lock on the Corsairs. 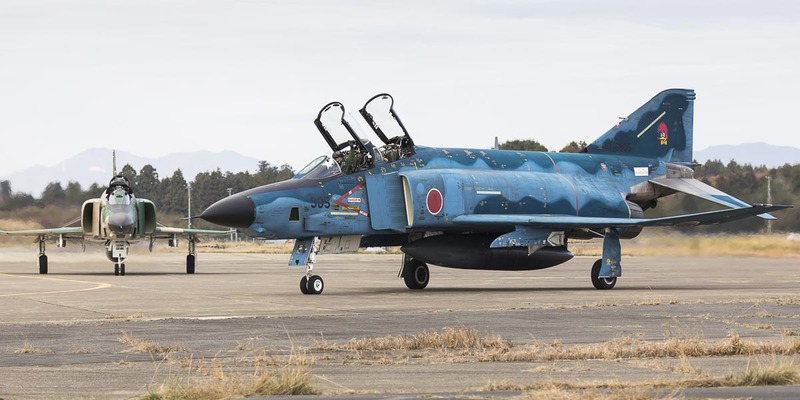 Additionally to this Corsair Pilots do not mention without proud the fact that the Phantom very often leave a simulated combat only as the second winner due to this. 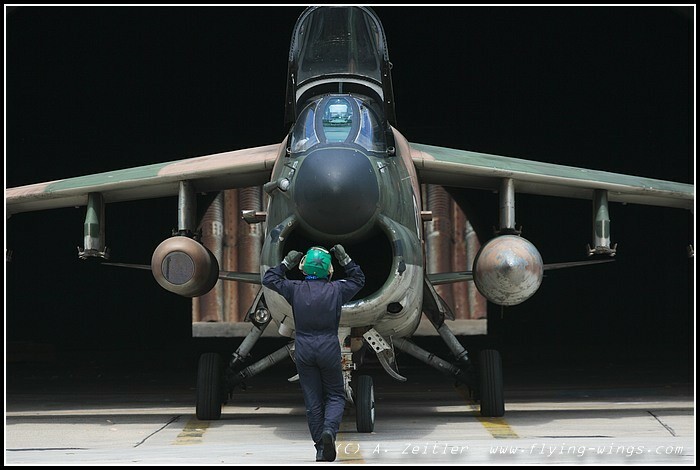 Furthermore to this the fuel consumption is not that high and the A-7 can stay on target a lot longer than its counterparts, giving it the chance to launch a last and maybe final attack when its enemy has to withdrawal. Followed by refreshement at the Squadron's Bar another visit outside was compulsory as the second round of aircraft was preparing for their mission. 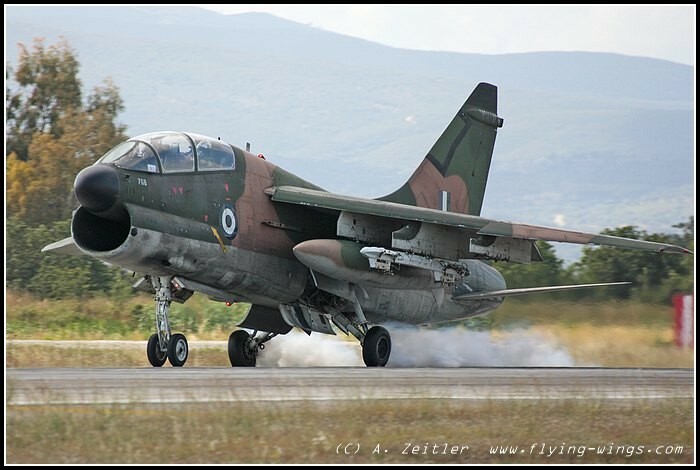 But of course the long range is not only of advantage in air-air sorties, but also in fullfilling the main task of the A-7 Corsair, and that is to deliver air-ground weapons. As there was no more flying foreseen in the afternoon I bought some patches as a souvenir before leaving and spend the afternoon cruising around to discover the beautifull countryside and of course to swim in the sea. That was an excellent way to finish this day. The next morning I have been back at Araxos, but this time a bit earlier in order not to miss the first take-offs, and it clearly paid off. 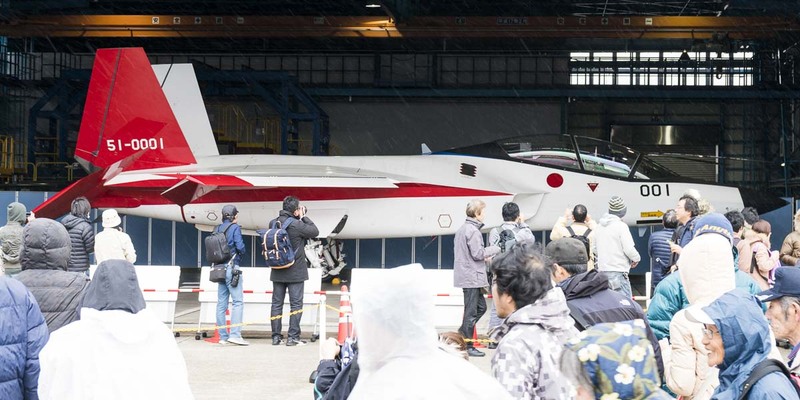 I once again did the tour of the shelter area, as the lighting conditions were better that day and some other aircraft were on place as well. Furthermore I did photograph some more ‘moving’ aircraft as six Corsairs were taking off on a mission. 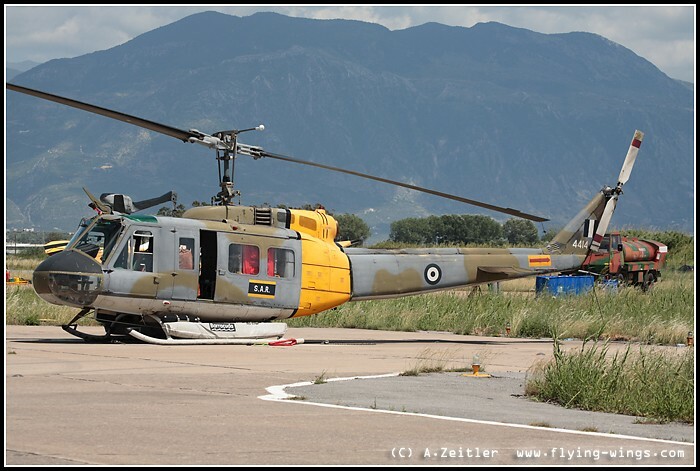 I wanted to wait for their return but had to learn that they went to nearby Andravida to participate in an exercise and would not return that day. Bad luck, but I still got the photos that I wanted to have and left a bit before midday to drive south to Kalamata. The 200km took some time as the road is not very good and at some places signs are nearly non-existing. Due to that I missed one turnoff, but fortunately took notice shortly afterwards as I was on the way to Olympia – one of the stops during a standard touristic trip to the Peloponnes, but not this time for me. I finally arrived at Kalamta for the afternoon shift of flying after I was welcomed by the base security. 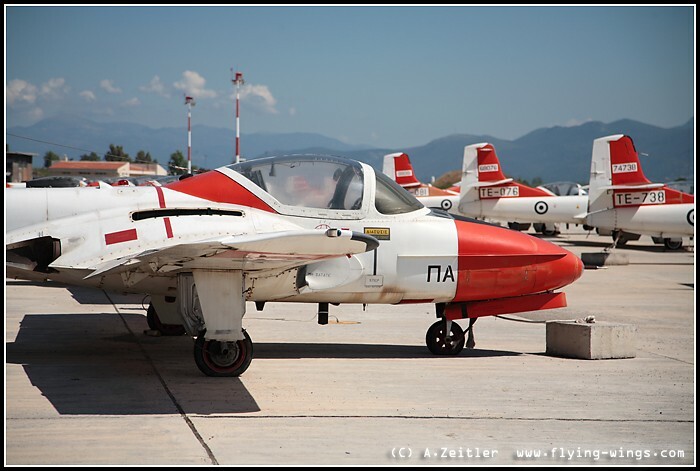 After the first training flights in Cessna T-41s Kalamata is the airfield where HAF pilots will have their first contact with real trainienr aircraft and are being prepared for their future profession. 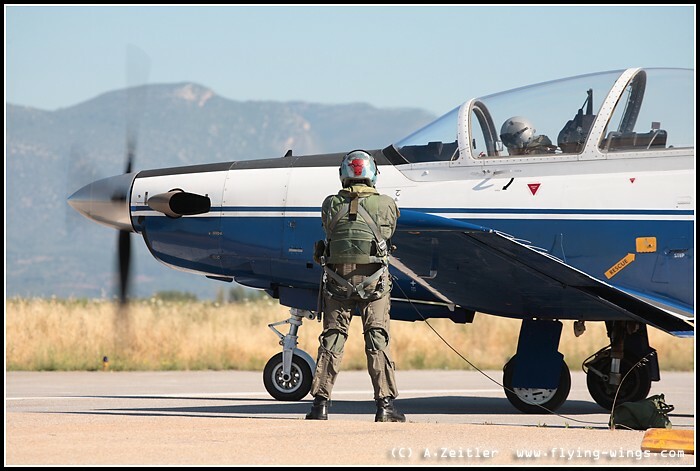 The decision for a replacement of the T-2 Buckeye seems to be imminent, therefore I wanted to document the co-existence of the modern T-6 Texan II turboprop trainer and the venerable T-2 Buckeye jet aircraft. 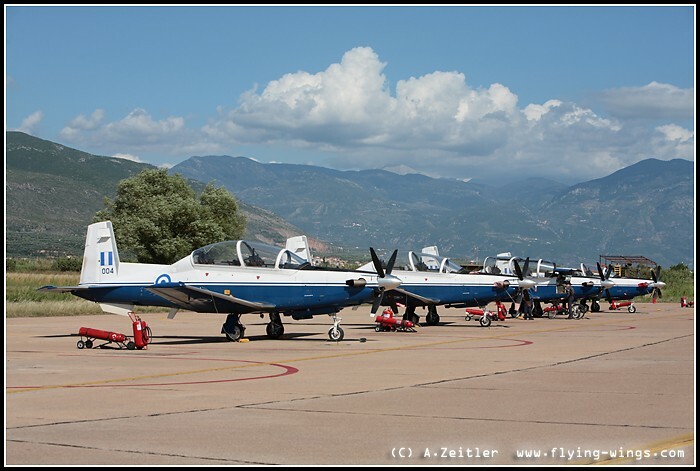 After the visit to the Buckeyes we headed on the apron of its successor, the T-6A Texan II, in service within the HAF since August 2000. The chances for photos there were also numerous and the personel very helpful so that I could get the motives I wanted. 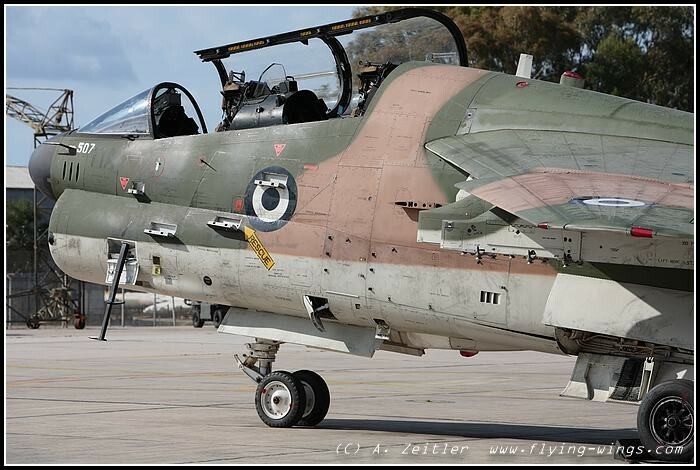 After a final visit to the T-2 flightline I left the airbase and already had in mind what I might do the next day. 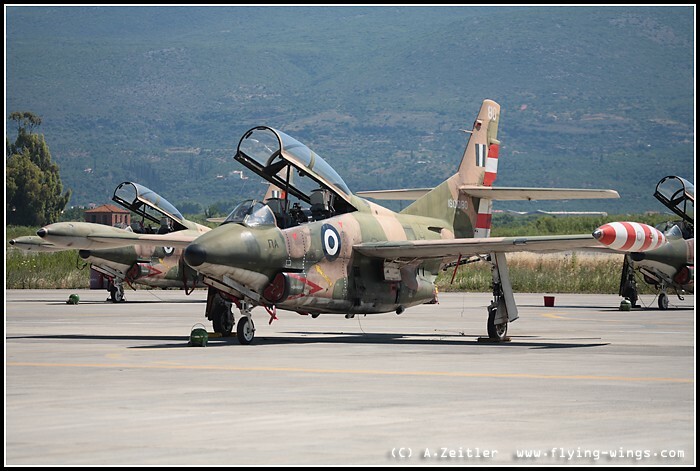 Opposite of the T-2s their predecessors were also still parked, the T-37 and around 25 examples are still in storage on the apron at Kalamata. The evening was been spent near Petalidi, where I also had a nice dinner in a restaurant near the harbour. The choice of placeswas not that easy, as there were a lot of free places - a clear indication of the number of tourists, that come to this scenic place during the main summer season. I am very much obliged to all the people that helped me during the organization and realization of this report, namely those in the German Embassy in Athens, the HAF Public Affairs and of course all the personal at Araxos and Kalamata that supported me on site.